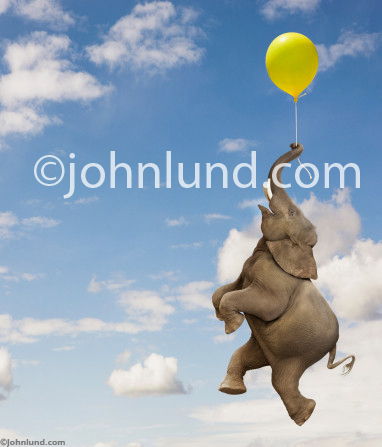 A funny elephant hanging from a yellow balloon is a popular and effective stock photo...see below to find out why! One of the earliest of our improbable and unexpected elephant photos is this stock image of a happy elephant hanging on to a yellow balloon with his trunk as he floats serenely through a summer sky. A number of factors work together to make this a successful stock photo. If you want to create a stock image that sells a good place to start is with the unexpected. In a time where we are bombarded with images to an almost unbelievable degree the unexpected can still stop us and have us take that all-important second look. An elephant…floating in the sky? That is unexpected. People enjoy seeing other people having fun (or at least most of us do). It has been well established that positive images outsell negative ones. In this case the elephant is wearing a happy smile…and the viewer can’t help but feel a bit happier seeing that smile…though the whole process happens subconsciously. Too, yellow of the balloon is a happy color…and the sky reminds us of a carefree summer day. The entire image works together to put us in a positive state of mind. The choice of the elephant itself as the subject is also important. People naturally gravitate to elephants and elephants are known for a number of positive traits. They are seen as loyal, noble, with excellent memories and strong emotional bonds to their fellow elephants. We are all in awe of their size, power and strength. On the whole, elephants are one of the most positively viewed of all animals. Another quality that can help produce a top selling stock photo is that of contrast. In this case the contrast is between the lightness of a balloon and the size and weight of the elephant. That is a contrast that is both fun to view and useful for a lot of advertising and editorial messages. This elephant stock shot has been crafted to facilitate easy cropping to square, vertical or horizontal formats and always with ample copy space for the addition of headlines and text. Making the image easy to use for art directors, photo editors and graphic designers is always an important consideration. Finally, to end up with a truly worthwhile stock image it never hurts to create an image that is both unique and hard to duplicate. To duplicate this image requires some appropriate, and hard to get, elephant photography. We photographed this elephant with soft directional light (using a huge silk to flag the sun) in order to facilitate the considerable Photoshop work needed to achieve the appropriate look and body position. The Photoshop work itself also makes the image more difficult to copy as not many people are willing to put an entire day into creating one image for the speculative venture of stock photography! To create this image, with the quality we achieved, requires and elephant shoot, an appropriate sky, a balloon shoot, and hours and hours of Photoshop work. Not a task for everyone. This funny elephant stock photo has been used for greeting cards, advertisements, and editorials and has certainly been well worth the effort in producing it. 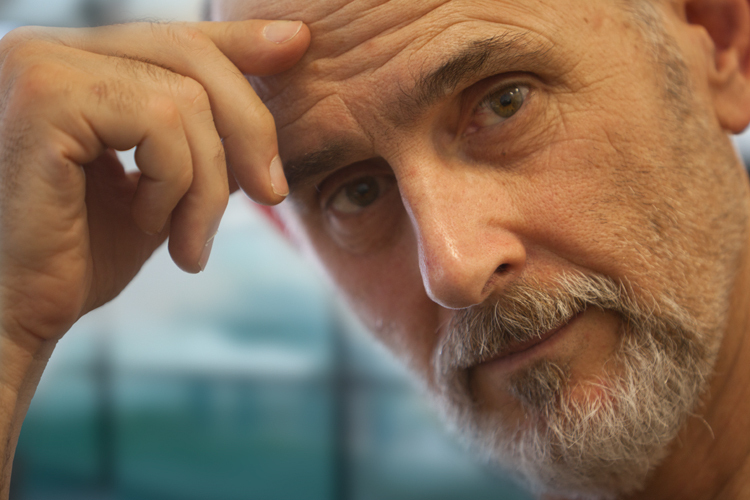 Perhaps even more importantly, it has brought a smile to thousands of people…and who can put a price on that!